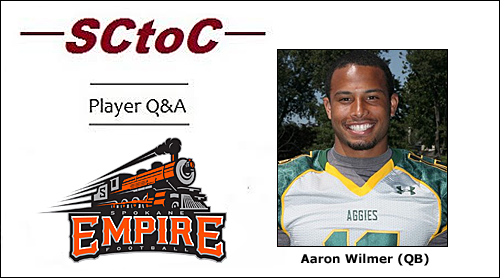 Aaron Wilmer is a 6'0'', 200 lb quarterback from Delaware Valley University. A native of Philadelphia, PA, he played all four of his seasons with Delaware Valley and earned four All-Middle Atlantic Conference honors, posting a 34-9 record as starting QB. He led the Aggies to a MAC Championship in 2011 and two trips to the NCAA Division III Playoffs in 2011 and 2014. After college, he spent time with the CFL's BC Lions. In his first IFL season, Aaron Wilmer began the season as the backup QB to starter Charles Dowdell. On May 26, 2017, Wilmer got his first start against the Colorado Crush. In the 48-43 victory, Wilmer helped stimulate an Empire offense that had scored no more than 36 points in 6 of their last 7 games. He completed 17 of 23 passes for 119 yards, 3 TDs and no interceptions. Along with RBs Andrew Pierce and Trevor Kennedy, Wilmer found success in the ground game with the read-option, rushing for 61 yards and 2 touchdowns on 18 carries. 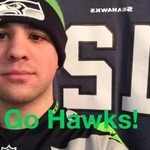 You can follow him on Twitter at aaronwilmer_13.